According to the research Health of Latinos in New York City by the New York City Department of Health and Mental Hygiene's, NYC residents who identify themselves as Latino or Hispanic account for nearly a third of the city's population. From 2000 to 2015, the Latino population grew by more than 14% to 2,485,125. The largest heritage groups in NYC are Puerto Ricans and Dominicans. More than Half of Latinos are US-born. Of Latinos born outside of the US, nearly three-quarters have lived in the US for 10 years or more. Latinos often identify by heritage alone and may not identify as a separate race. 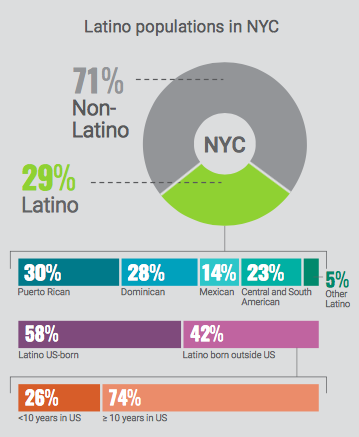 Among NYC Latinos, 7% identify as Black, 37% identify as White and approximately 55% identify as Other. The Latino population is younger than the non-Latino population, with a higher percentage of children, teens and young adults and lower percentage of older adults. Read the entire research HERE.